Our cable necklace is the new European style necklace that fits most collectible large hole beads like those from Biagi, Pandora, and Troll. The silver plated alloy rope chain has a magnetic copper clasp is easy to customize. Simply open the magnetic hinge or clasp and remove the lobster clasp to add beads. You can fill the entire necklace with hippos or choose decorative accent beads to your liking. 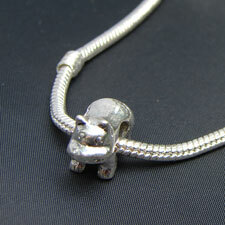 We start your collection with this silver plated walking hippo bead.